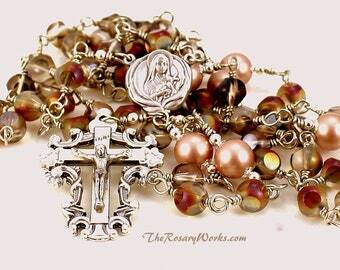 The Pater beads in this rosary are comprised of handmade lampwork beads. This particular style of lampwork is known as wedding cake beads. These beads have an intricate motif of adventurine draped around the transparent lavender background. Then they are adorned with blue, red and yellow flowers. After that, silver colored glass has been added to accent the details in the beads. The Avé beads are 6mm white glass beads encased in silver plated filigree bead caps. The intricate Miraculous Medal centers honor Our Lady of Grace and are comprised of silver colored metal. The crucifix is comprised of lead free pewter. I have made this rosary extra long to insure the ease of using it during the wedding ceremony. 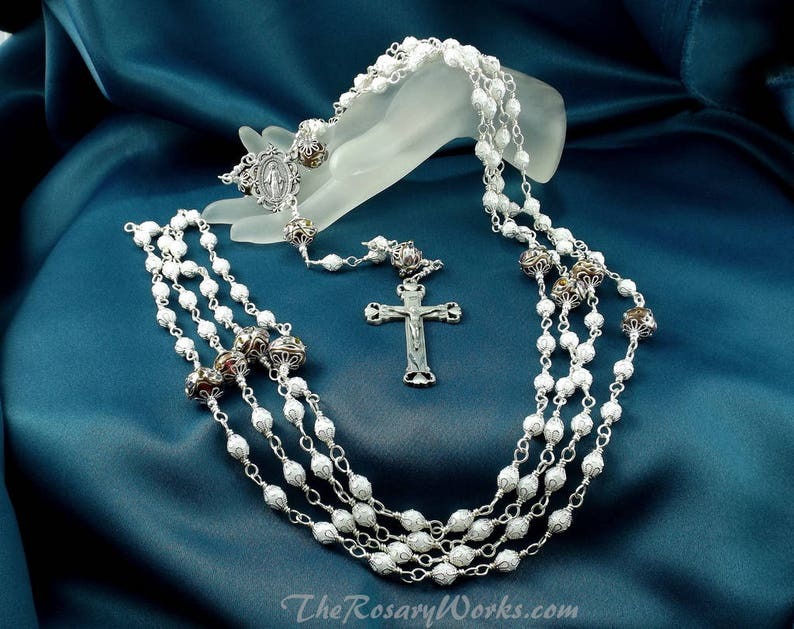 This is an heirloom quality rosary and would make a wonderful wedding gift. It would also be great to keep for your own wedding. If you would prefer the white with silver wedding cake beads depicted in the 6th,9th and 10th photos, please choose from the options available. PLEASE NOTE: The heart shaped centers seen in the 9th and 10th photos are no longer available. If you choose the white with silver wedding cake beads, the Miraculous Medal centers shown in the other photos will be the ones used to create your Lazo rosary. The total length of the rosary is 39 inches if you are holding the ends of the loops in one hand and the crucifix in the other. The LAZO or LASSO Wedding Rosary has Mexican origins. Basically, a Lazo rosary is two full rosaries joined together by one crucifix. It symbolizes the union of the bride and groom in marriage. Traditionally, the godparents or sponsors of the couple getting married place the rosary around the bride's neck and around the groom's neck during the wedding ceremony. Special prayers are then said to join them in Holy Matrimony. After the wedding, one of two things can be done. Some couples keep the rosary so that they can use it to pray together and then later pass it along to their children when they get married. Other couples break the rosary down into two separate rosaries. Then they give one rosary to the bride's mother and the other to the groom's mother as keepsakes of the wedding. ABOUT UNBREAKABLE ROSARIES: This rosary was constructed in such a manner as to make it unbreakable with normal wear and tear. The tarnish resistant, silver plated wire is coiled 2 1/2 times at either end of each bead. Furthermore, the interlocking loops prevent the type of breakage that occurs with most traditional linked rosaries. With normal prayer, this rosary should last long enough to hand down to your children and to their children. IMPORTANT: Please check your Etsy Conversations frequently if you make a custom order with me. There may be questions that I need answered or there may be information that I need to let you know. I only communicate thru Etsy. I do not communicate thru personal emails or on the phone.